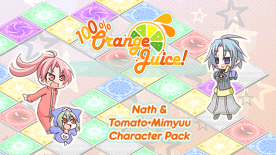 100% Orange Juice - Nath & Tomato+Mimyuu Character Pack adds 2 new playable character combinations from developer Orange Juice's games. Meet Nath who powers up with battle cards to devastating effect, and the prankster duo, Tomato&Mimyuu with their unique tag team play. The new characters are designed by Orange Juice's original staff for the game's English Steam release, with character and card artwork by Hono. Please note: Requires 100% Orange Juice (base game) to use this DLC.